I've had a life-changing discovery this year. That is: eating healthy can be easy and sustainable. This blog is a chronicle on how I morph from a fast food eater to a better one. And by better, I mean someone who is not a freak but rather one who appreciates the power of healthy yet equally tasty food. I'd like to share with you our dinner last night. Simply slice the onion. Put them on a large lunch box. Sprinkle brown sugar, salt and pepper, garlic powder. Shake shake shake! Put on 2 tbsp. of olive oil in a pan. Once the pan is hot, put on the onions and leave it until cooked. Tip: It depends how 'cooked' you want them to be. I'd like it thoroughly cooked so I let them caramelised for a good 15 minutes or so! 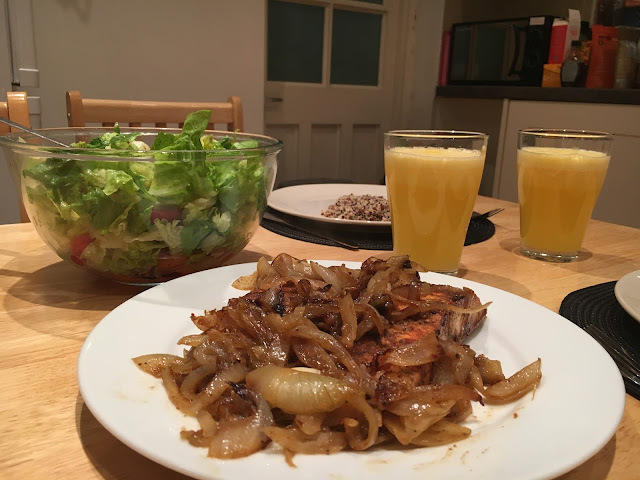 Season the salmon with teriyaki sauce, paprika, garlic powder and onion powder. Add salt and pepper to taste. Leave it for 5 minutes or so. On the same pan (with our caramelised onion), shove the onions and free up the centre part of the pan. Put the salmons side by side with the skin up. Cook them for 15 minutes and serve them on a warm plate. 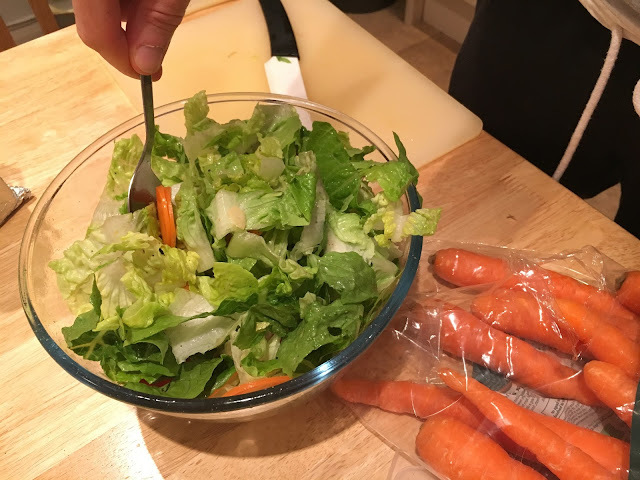 Cut your greens, tomatoes, carrots and toss them on a salad bowl. Add pumpkin seed oil and balsamic vinegar, if you fancy. 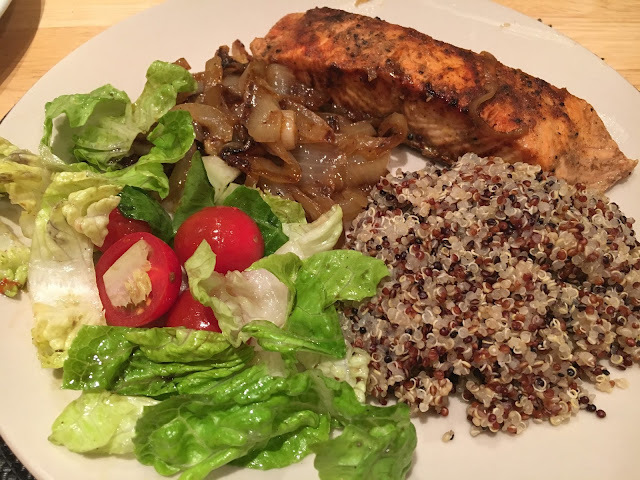 Serve them with the salmon and quinoa combination. 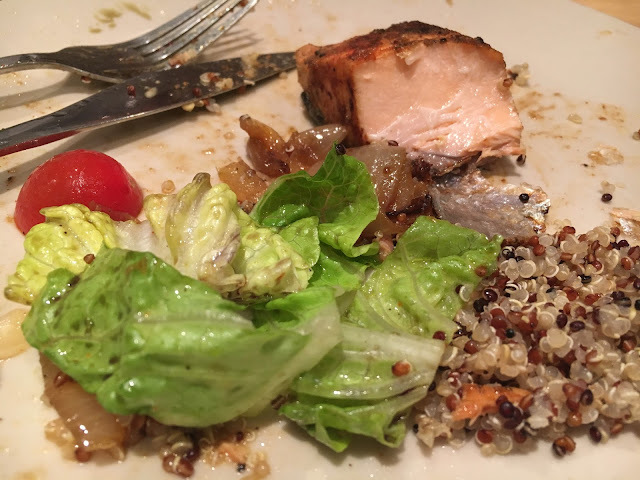 I am using quinoa from Watirose here. Cook them as you would cook a rice (add more water, if needed). Tip: If you've got leftovers, you can make a quinoa green salad as your packed lunch the day after! 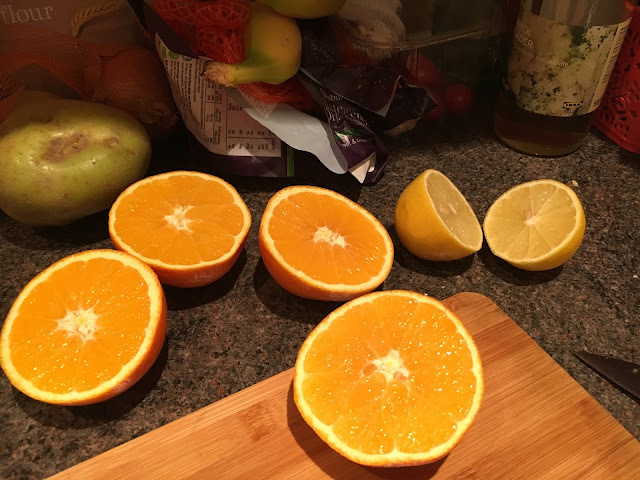 Squeeze 2 oranges, a lemon and cut the ginger into small square. Add some water and Nutribullet it! Easy peasy! This one's really timely because the juice will give you a much needed immune booster during winter time!